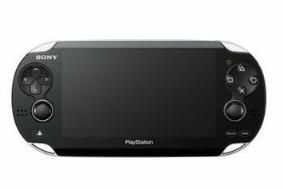 Sony reveals new PSP console, plans to bring PlayStation games to Android | What Hi-Fi? The Sony NGP has a 5in OLED display with touchscreen control. There's a multi-touch pad on the rear, designed to allow players to interact with games in three dimensions, using grab, trace, push and pull moves. Additonal features include two analogue controllers, motion sensors, a gyroscope and accelerometer, front and rear cameras and 3G/wi-fi internet access. The quad-core processor is based on the ARM Cortex A9. Built-in GPS will allow location-aware games in the PlayStation Network, and and an application called Near will let you know if your friends are ... near you. Details were revealed at a Sony press event in Tokyo. Sony Computer Entertainment president Kaz Hirai also outlined his plans for the future of portable PlayStation entertainment. This includes a new "PlayStation Suite" which will bring PS games to Google Android devices. Sony says it will provide a game development environment for studios who want to bring PlayStation-quality games to Android phones. The company still plans to release a PlayStation-branded Xperia handset of its own.